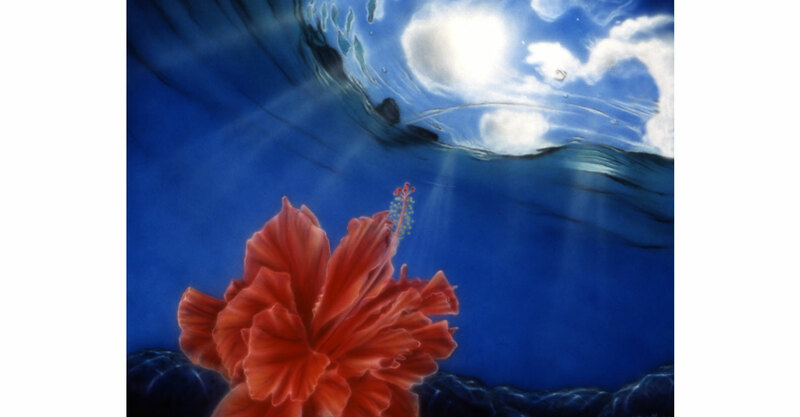 “Ocean Flower” is an answer to the Hawaiian State Motto of “Ua Mau Ke Ea O Ka Aina I Ka Pono”, or “The Life of the Land is Perpetuated in Righteousness”. The hibiscus is Hawaii’s state flower and, here, is brought from the land to the ocean, to draw attention to the life and beauty in the water. “The Life of the Ocean is Perpetuated in Righteousness” is the case of this painting. “Pua Moana” lives in Kauai.